D’aw! Just as I suspected, the little sneakster! I love it though. 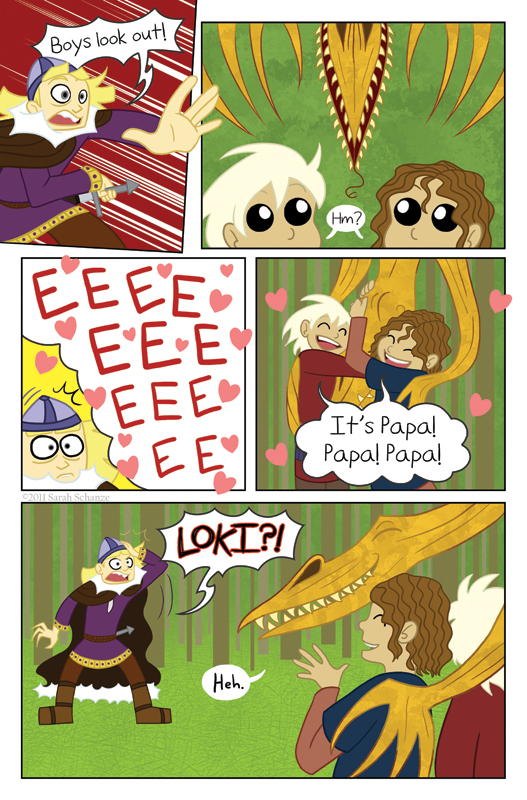 It’d be so cool to have a shapeshifter as a dad… Or just Loki. XD I’d take Loki, too. Haha. Funny, I stay up late to work on fanart, and I glance around for a reference and pop! new page. Totally worth losing the sleep on my early wakeup call for. <3 Love how adorable the twins are. Also: YAY to not being able to sleep when sick >.> I got to see the new page! Awwwww, squeeees of delight. It’s good to be home. However, is this a favorite persona of Loki’s, or do the boys just assume that any monster is Papa? If the latter, then the Loki family should definitely look into acquiring an au pair. Orrrrr, maybe the kids can see right through Loki’s shapeshifting glamour? He should have! Really, nothing like this should surprise him. if this gets any sweeter, i gonna get a cavity. awesome work, as always! Can they see through his disguises magically/innately, or are they just so used to him that they can smell the prankster from a real threat by now? I can’t help coming back and staring at the cuteness. xD I don’t wanna get to chapter forty! D: *twitches* I know too much about Norse myth and I don’t WANT to see [EDITED BY SARAH FOR SPOILERS sorry]. >.<! Don’t spoil it! Though I guess the spoilers are out there, but I’d rather keep the pages themselves spoiler-free if I can. XD At least with specifics. That’s awesome. I would totally do that if I could transform into a creepy dragon. Please continue to surprise us. Is it just me or do the kids eyes look glued on. Happy Father’s day…………What the %$#^. Tonight on springer, my father’s a monster but I love him anyway.